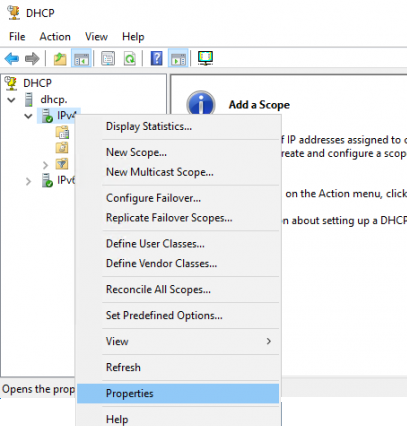 Home » Windows » How to Configure DHCP Conflict Resolution? How to Configure DHCP Conflict Resolution? Another computer on this network has the same IP address as this computer. Contact your network administrator for help resolving this issue. More details are available in the Windows System event log. The system detected an address conflict for IP address 192.168.10.16 with the system having network hardware address 0A:1B:1A:BB:BB:BB. Network operations on this system may be disrupted as a result. When an IP address conflict occurs, only the device that first appeared on the network has LAN access. On the second one there is no access to the IP network. Diagnosing an IP address conflict is quite a complicated and tedious task. As a rule, it is necessary to look at the port status on network switches in order to determine the MAC address of the device where a non-unique IP address is assigned. DHCP server is used to automatically assign the IP addresses, and thus prevents the occurrence of IP address conflicts on the same network (it cannot issue the same IP address to different devices). However, using a DHCP server doesn’t guarantee you the absence of the appearance of IP conflicts in your LAN. For example, a new device may appear on your network with a static IP address specified in its settings (this could be a computer, sender, printer, etc.). This IP address may be included in a pool of dynamic IP addresses distributed by a DHCP server. Theoretically, a situation may arise when a DHCP server issues an IP address to a new client, the same IP as set on some device on the network. As a result, an IP address conflict will occur. To avoid this situation, the DHCP server must check if this address is being used on a device on the same subnet before issuing an IP address to a new client. 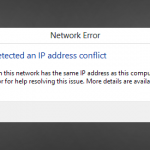 In the DHCP server running on Windows Server 2016, there is a special option for checking IP address conflicts. To do this, open the DHCP management console, and open the properties of the IPv4 (or IPv6) node. Click the Advanced tab. Note the option Conflict detection attempts. 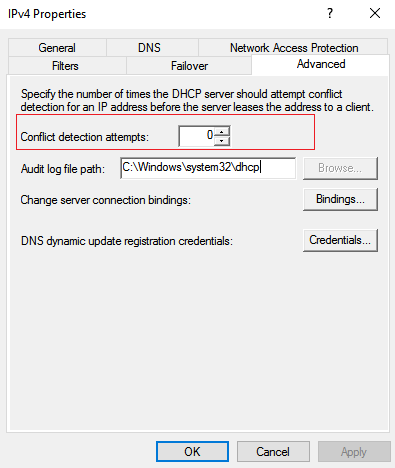 Here you can specify how many times the DHCP server should check the IP address before issuing for a conflict. You can specify a value from 0 to 5. By default, 0 is specified here—it means the DHCP server doesn’t check the IP address before issuing it. If the ConflictDetectionAttempts parameter is greater than 0, the DHCP service, before issuing a free IP address to the client, pings the IP address to check whether it is available or not. 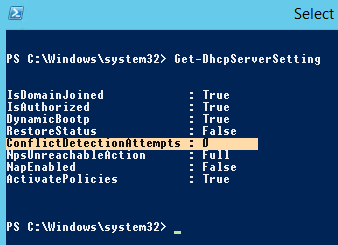 Each additional attempt to detect a conflict delays the response of the DHCP server for 1 second (usually it’s not recommend to set this value greater than 2).